Between September 2017 and May 2018, students of the practice module of the University College London Master’s Degree Programme in Environment and Sustainable Development (ESD), led by Adriana Allen and Rita Lambert in collaboration with Julia Wesely, conducted action-research in Freetown. 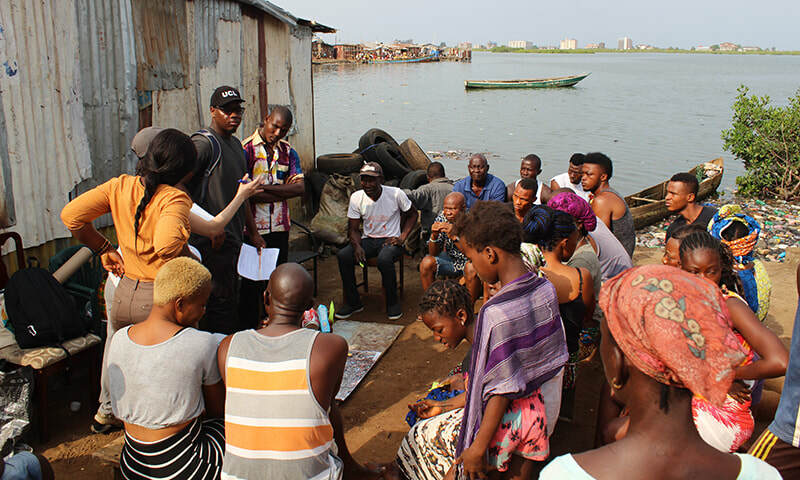 The aim of the research is to contribute to an understanding of how and why risk accumulation cycles or ‘urban risk traps’ affect local dwellers and their communities in Freetown’s informal settlements, and how they can be disrupted in a structural way. This research was based on the recently established learning-alliance between ESD and the Sierra Leone Urban Research Centre (SLURC) in collaboration with the Federation of the Urban and Rural Poor (FEDURP), Pull Slum Pan Pipul (PSPP) partners and the communities of six case study areas: Portee-Rokupa, Susan’s Bay, Cockle Bay, Moyiba, Dwarzarck, and Crab Town-Kolleh Town-Gray Bush. The action-research culminated in a 2-week field trip at the end of April, where the students, interns and community facilitators together with SLURC co-directors Braima Koroma and Joseph Macarthy and staff members Ibrahim Bun Kumara, Sulaiman Karama, Sudie Sellu, Abu Conteh, Alexander Stone together with DPU tutors Adriana Allen, Donald Brown, Pascale Hoffman, Rita Lambert, Diana Salazar and Haim Yacobi engaged with these six localities to inform the development of local action plans. The following videos present the outcomes of these intense field-work period and preceding desk research and provide insights into the production of urban risk traps and the potential for transformative action in the areas studied. The six videos are available through on the MSc ESD overseas fieldwork page.